The 1911 Guerrero earthquake occurred on December 16 at 12:14 local time near the coast of Guerrero, Mexico along the Mexican subduction zone. The earthquake's energy was calculated using several different magnitude scales with an estimated moment magnitude of 7.6 and a surface wave magnitude of 7.8. Following the event, telegraphy reports came in from a broad area of Mexico. Cities from Guadalajara, Mérida (on the Yucatán Peninsula), and Tapachula (near Guatemala) all reported the tremors. The duration of the shaking was just over two minutes and the death toll was placed at 28. In the region, the Cocos, North American, and Caribbean Plates converge and create a tectonic zone of consistent and long term seismicity. 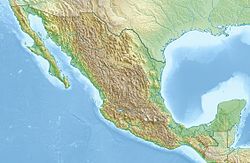 Guerrero is located where the Cocos plate is being subducted under the North American plate, and the rupture area of the earthquake may have occurred in the Guerrero seismic gap, which is a 200 kilometers (120 mi) stretch along the Middle America Trench that had not experienced movement nearly as often as nearby segments of the subduction zone. The convergence rate of the Cocos and North American plates in the Guerrero seismic gap varies between 53–58 millimeters (2.1–2.3 in) annually. This level of precision was made possible after the installation of permanent GPS monitoring stations, the first of which was installed in 1997 at Cayaco, Guerrero. The gap was defined as having a northwest section and a southeast section. The most recent significant events in the southeast sector were the 1907 and 1957 Guerrero earthquakes with respective magnitudes of 7.9 and 7.8. The 2007 report stated that the northwestern zone has not experienced a significant release of energy since the December 1911 event. There were reports of walls and fences being damaged and part of a market's roofing frame falling and causing injury. The electricity had been cut for a time in Mexico City. The greatest damage may have occurred in Chilpancingo, the capital city of Guerrero. According to the El Paso Herald issued on December 18, people in Mexico City rushed to the Zócalo running aimlessly or praying during the earthquake. The then Mexican president Francisco I. Madero, conferring with some of his cabinet members at the moment, was standing in front of a window in the National Palace, watching the scene, laughing without fear, and remained there until the earthquake stopped. ^ a b c d El Paso Herald (December 18, 2011). "Mexican Tremors Kill 28 people; Volcano of Orizaba Belches Smoke, and Cloudburst at Taxco Kills Five". El Paso Herald. Retrieved March 17, 2012. ^ Engdahl, E. R.; Vallaseñor, A. (2002). "Global seismicity: 1900-1999" (PDF). International Handbook of Earthquake & Engineering Seismology. Part A, Volume 81A (First ed.). Academic Press. p. 672. ISBN 978-0124406520. ^ A R Lowry; K M Larson; Vladimir Kostoglodov; O Sanchez (2005). "The fault slip budget in Guerrero, southern Mexico" (PDF). Geophysical Journal International. 200 (1): 1–15. ^ Kostoglodov, V.; S. K. Singh; J. A. Santiago; S. I. Franco; K. M. Larson; A. R. Lowry & R. Bilham (2003). "A large silent earthquake in the Guerrero seismic gap, Mexico". Geophysical Research Letters. 30 (15): 1807. Bibcode:2003GeoRL..30.1807K. doi:10.1029/2003GL017219. ^ Luz Elena Pereyra R. "Dos siglos de temblores". Archived from the original on 2008-02-03. Retrieved March 17, 2012. This page was last edited on 14 March 2019, at 10:36 (UTC).